Precipitate Provides Exploration an | Precipitate Gold Corp.
Vancouver, B.C. 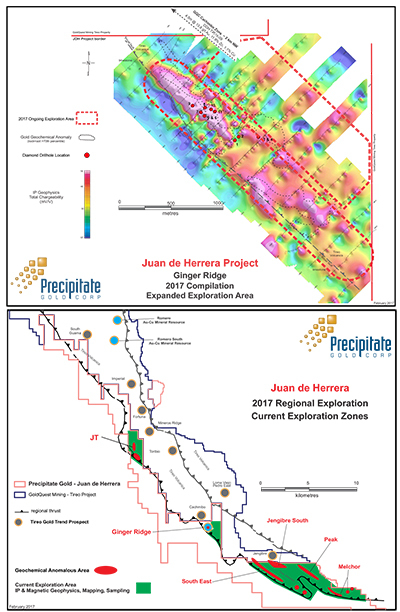 – February 22, 2017 - Precipitate Gold Corp. (the “Company” or “Precipitate”) (TSXV: PRG) is pleased to provide an update on exploration and drill targeting activities ongoing at the Company’s 100% owned Juan de Herrera Project in the Tireo gold district of the Dominican Republic. Exploration and target vectoring work is ongoing at multiple key areas throughout the project. The Company’s technical team continues to progress with exploration and evaluation of multiple prospective zones that have not yet been drill tested (see accompanying maps for details). The systematic advancement and ranking of these targets leading to future drill testing is the primary directive of the Company’s current exploration efforts. All five of the previously outlined geochemical targets beyond the greater Ginger Ridge area (namely the JT, Southeast, Jengibre South, Peak and Melchor zones) are situated within a substantial host-rock volcanic environment, where detailed induced polarization (”IP”) ground geophysical surveying is currently being conducted as a final step in prioritizing the zones for possible drill targeting. Phase 2 drill program was planned to consist of up to 2,500 metres and up to 12 holes. To date, only 1,310 metres and 5 holes have been completed, leaving over 1,000 metres of drilling still to be contemplated as part of this phase. The drill remains onsite at Ginger Ridge and is available for re-commencement of drilling upon completion of final evaluation and delineation of immediately worthy targets. It is the Company’s intent to resume drilling as soon as current comprehensive target vectoring efforts are completed. In addition, the Company is further analyzing and evaluating recently announced drill assay results and core from the first five (5) drill holes reported from the Phase 2 drill program (see the Company’s news release dated January 19, 2017). Though initial assay results from these holes did not return gold grades as robust as was reported in the 2014 discovery hole (“Hole 5”), the intervals of sulphide-silica alteration combined with anomalous gold (and local copper-zinc) enrichment appears to show various characteristics often associated with a volcanogenic massive sulphide (“VMS”). Current follow-up work is seeking to utilize this analysis as a means of better understanding the mineralization and vectoring toward an interpreted source or feeder, which, if discovered, could host substantially richer mineralization.